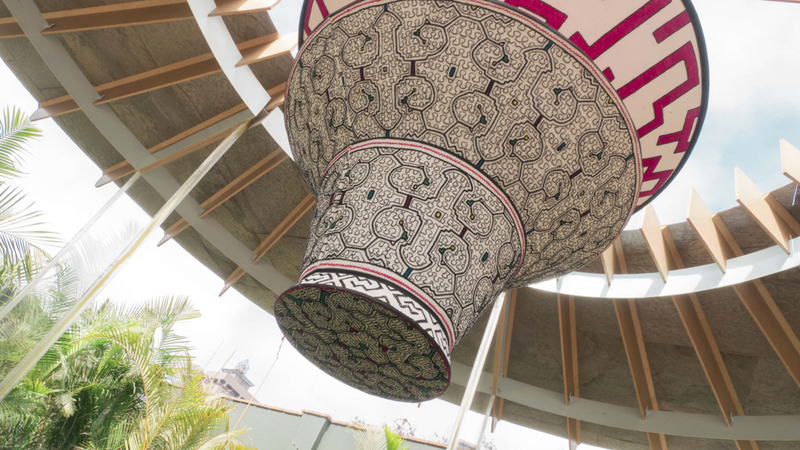 Juan Sebastian is a Colombian designer who has been working with the Peruvian Shipibo–Conibos design traditions to create new and modern products, while drawing from the past. He designed prototypes for a series of lamps inspired by the Shipibo-Conibos traditional ceramic vessel, combined with the elements of air and earth. The Shipibo–Conibos community lives in the Peruvian Amazon in the Ucayali region. They live modern lives in the 21st century, while still honouring their past, which spans millennia in the Amazonian rainforest. Many of their traditions, such as ayahuasca shamanism, are still practiced. The shamanistic songs have inspired artistic tradition and decorative designs found in their clothing, pottery, tools and textiles. These are the inspirations for Sebastian’s lamps.